« Wovember 2013 is here! Wovember is well underway now, and I’m thoroughly enjoying myself getting woolly content to all the Wovember readers, together with Kate Davies and Felicity Ford. 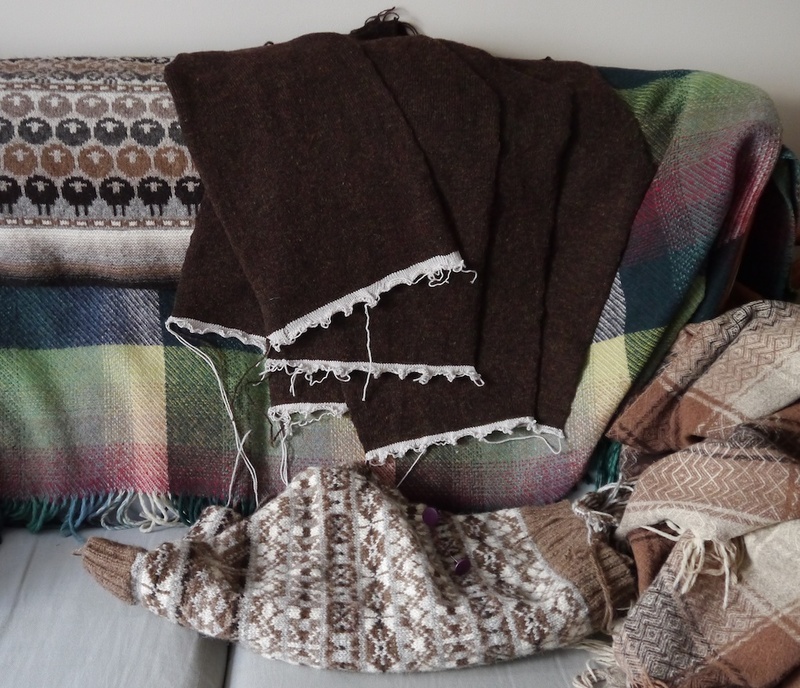 Wovember celebrates the wool for what it is, and one of the ways we’re celebrating is with a WAL, or Wool-Along: start and finish a project made from 100% wool during the month of Wovember! Find out more on the Wovember blog. My WAL project is my first ever machine-knit garment. A cardigan, knitted in Jamieson’s of Shetland Spindrift in the colourway Grouse. I picked up a 900g cone during my visit to their mill in Sandness. As I have a single-bed knitting machine, I cannot do ribbing on it. The usual way would be to first hand-knit the ribbing, and then transfer the stitches to the knitting machine. Then you can continue using the knitting machine and knit the panels for your garment. 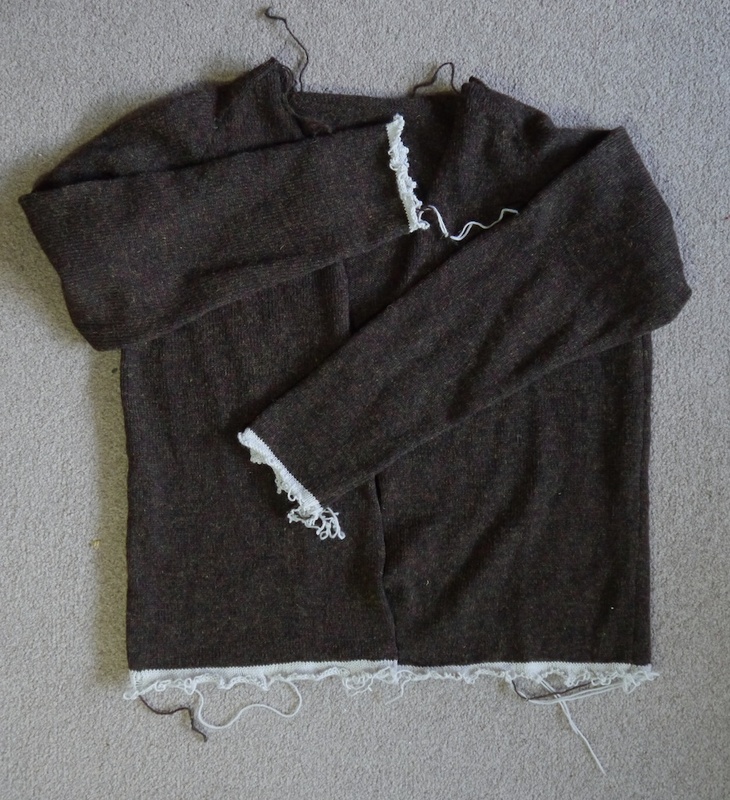 I copied the pattern pieces’ measurements from an existing, shop-bought cardigan. As this had slightly shrunk in the wash, I had to add a margin to all the pieces in order to make it fit. As I wasn’t quite sure if this was going to work out, I decided to do things in a different order. I first knitted the pieces, so I could seam them together and try it on, before adding the ribbing. If reknitting would be necessary, then I would at least only have to reknit the machine-knit part of it, which would take much less time. To make it easier to pick up stitches for the ribbing, I started the pieces with some rows of waste yarn in a contrasting colour. As the Spindrift yarn is rather delicate, I decided to seam these pieces together with a back stitch, rather than the more usual mattress stitch, as this results in a more elastic seam, and thus less chance of the seam breaking with wear. I used short pieces (about 15in long,) and it was easy enough to add on some more by spit-splicing. I’m pleased to report that the cardigan fits, and all that’s left to do, is to unravel the waste yarn, pick up the stitches with a circular needle, and hand-knit the ribbing. After that I will pick up stitches on the front pieces and the collar to add a garter stitch button and collar band. Keep an eye for my next progress post, and don’t forget to visit Wovember to embrace WOOL! Looking good! What machine have you got Tom? A Brother kh-710 which I found at a flea market for £20. It’s complete with lace carriage and all the bits in the notions box, even the cast-on cord.